Electric heat trace snow melt projects require significant expertise in designing the custom layout for each application to ensure effective surface heating while reducing energy usage. Our experience in projects both large and small will be put to use on all projects that we work on for our customers. Supplied a system that included 4,000 ft process pipe heat trace and a custom multi-circuit control panel to ensure that the dairy products in the process were kept at a consistent temperature. When Yahoo built a 275,000 square foot data center we designed a roof and gutter heat trace system that ensured that the snow on the metal roofs would melt and the ensuing water would safely flow away from the building. Designed a pipe freeze protection system for fire system and process piping inside refrigerated warehouse space. To ensure guest safety, we designed a full roof and gutter snow melt system to prevent snow from building up on flat roof surfaces near the main entrance of the casino. This system included a complex control design that used sensors in several different locations to guarantee that the system would always be on when needed. Because of the unique architectural features of the cathedral and the heavy snow fall in Upstate NY, dangerous ice dams and icicles would form on the front of the building. Using a system that included both MI cable and self-regulating heat trace we were able to eliminate this hazard. Developed an electric heat trace immersion snow melt system that is embedded in the concrete and operated by sensors that measure temperature and moisture for the vehicle and pedestrian entranceways to minimize the use of salt and sand. Because of the heavy snow fall in Rochester and the flat roof on the building, keeping the snow away from HVAC and other critical equipment was difficult. Our system now assures that the snow is melted and guided away from the equipment using self-regulating electric heating cable. The steep roofs on the higher levels created ice dams at the roof valleys along with ice and snow buildup on the lower level metal roofs. An electric heat trace roof and gutter snow melting system was designed and installed to eliminate this problem. Immersion snow melting was installed in all of the walkways at the front on the convention center that included a custom solution embedded in the steps prior to pouring the concrete. Because the downspouts on the roof were installed near the dock doors, ice backups were causing large icicles to fall and damage trucks. Installing an electric heat trace system in the gutter and a double run through the downspout eliminated this problem. Steep roofs and glass lined vestibules are prime targets for ice dams as the internal temperature changes create melting and freezing conditions on the roof. Our self-regulating heating cable system assures that the cable is only on when needed and keeps the ice from forming. Because of the large number of entrances and exits to City Hall and the unique features of the building, we designed a heat trace system to prevent ice damns or icicles from forming near entrances to ensure pedestrian safety. Designed immersion snow melting embedded in the concrete at all of the entrances and a large system of electric pipe trace cable for the sprinkler system freeze protection. Designed immersion electric heat trace snow melting system for the walkway, the valet entrance, and a patio area in the center of the complex that was centered by a fire pit so that the area was already cleared. Our team is here to help you with all your Heat Trace needs. 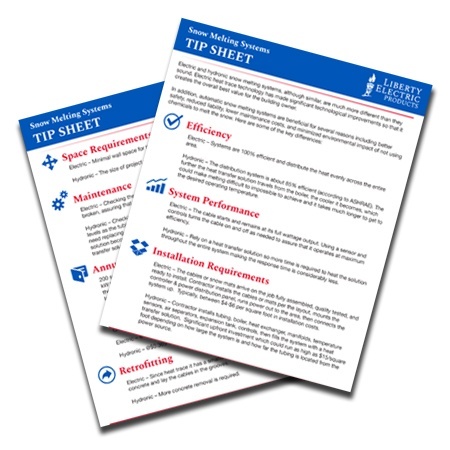 Download our Snow Melting Systems Tip Sheet to learn the differences of electric and hydronic systems. Providing local support throughout Upstate New York with our experienced team of field sales engineers. Follow us on social media to stay up to date with recent product announcements and industry related news. Sign up for our mailing list and join the community of engineers, architects, and contractors to get our latest technical resources in your inbox.